Halston and I: IMAGES OF CHIC!! Just wanted to take a moment to have a little fashion chat, this being a holiday weekend and season. First of all, I want to discuss a group of seven women that Truman Capote dubbed "The Swans", these were women of extraordinary chic, who not only were muses of some the greatest designers, but whose personal style had immense impact on the fashion world. The Swans included the following: Babe Paley, Slim Keith, Gloria Guinness, C.Z. Guest, Marella Agnelli, Lee Radziwill and Pamela Harriman. Two of my favorites are Babe Paley and Slim Keith. Barbara Cushing -Mortimer-Paley was one of the Cushing sisters from Boston who were renowned for their beauty and all were groomed by their ambitious mother to marry into money and titles. 'Babe' was married and divorced from her first husband who made his fortune in oil and later married the founder of CBS, William Paley. She was the perfect 'trophy wife', Paley a Jew, needed and wanted someone who could gain him entrance into the rarefied world of WASP society, Babe was the perfect choice. It is said that if she was in a hurricane, the winds would blow around her and not muss a hair on her perfectly coiffured head! LOL!! She embodied style and lived for it. She once casually tied a silk scarf to her shoulder bag...a charming feminines gesture that was immediately copied by women everywhere! Her own children never saw her without makeup or looking anything other than picture perfect. I think this picture says it all and I have it on my bulletin board in my sewing room. She smoked like a chimney and at the age of 65, I believe, was diagnosed with lung cancer. Upon learning that fact, she immediately set about the task of making arrangements for her funeral, everything was personally handled by her from the dividing up of her jewelry to the flowers arrangements and catering, nothing was left to chance. She is of course in the fashion Hall of Fame and considered one of the most elegant women of the 20th century. Of course you know I have to throw in the fact that she wore Halston and would plan couture wardrobes with him right down to her shoes. Another Halston client and favorite of mine is Nancy 'Slim' Keith.......the California born golden girl! Slim loved a sporty, casual look and wasn't into the fussiness of European couture. She was seen at Hollywood parties on the arm of Gary Cooper and Cary Grant and pursued by Clark Gable and Ernest Hemingway......".Miss One" was the bomb!! LOL!! Her sense of style of course, earned her a place in the fashion Hall of Fame. She looks so fabulous here in her tailored to the nines red cropped jacket and perfectly fitting pants, the tailoring offset by the seductive feminine charm of her white top, her hair pulled casually back giving you a fresh clean face!! Totally fabulous!! This is a woman the men in the room couldn't keep their eyes off of! What do we have today?? Where is refinement and understatement??!! Why are women today sooooo insecure that they'll go to the extent of not wearing underwear to get attention! I've always believed in the old maxim that less is more and something should be let to the imagination.......but then I would be considered out of sync with the times my some. I always believed in understatement which is why I'm a totally devoted follower of Halston and the timeless legacy he has left. On a side note........has anyone heard any updates about the release of that documentary on Halston? The waiting to get my hands on that dvd is killing me! LOL!! Let me know if you have any news! Happy holidays to all! Cheerio!! 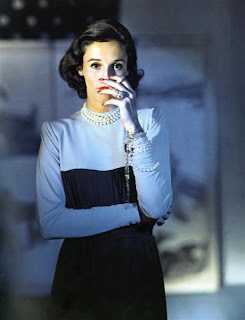 Always liked Babe Paley and her story. Random thought: Wonder how tall she was? Her style was killer!